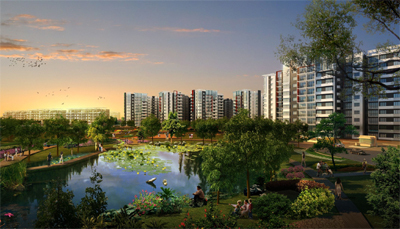 An artist‘s impression of the Celadon City project which is running at full steam. PETALING JAYA: Although high interest rates in Vietnam will continue to dampen property sales, Gamuda Bhd is bucking the trend with its Gamuda City development in the south of Hanoi, HwangDBS Vickers Research said. It said Gamuda City and Celadon City in Ho Chi Minh City (HCMC), both held under Gamuda's property arm Gamuda Land Sdn Bhd, were running on “full steam” despite the increased borrowing costs brought on by the country's notoriously high inflation. “Gamuda City's first three launches have been sold out, raking in sales of RM220mil while it has also raised its sales target for the financial years 2012 to 2013 to RM500mil and RM750mil, respectively. “Sales at Celadon City are more subdued but we expect the recent land sale to AEON and completion of show units to buoy strong residential sales going forward,” the brokerage said in a report after a recent site visit. It pointed out that Gamuda remained the strongest Malaysian proxy to Vietnam with a total gross development value of RM14bil. “In our view, we think the market is assigning minimal value to its Vietnam exposure but we expect this to reverse once country-specific issues are addressed,” it said. On SP Setia Bhd, which also made the move to Vietnam some years ago, HwangDBS Vickers Research said it has put its Eco Lakes project in HCMC on the backburner as it turns its attention to Eco Xuan, which is closer to the city's central business district. Nonetheless, SP Setia is looking to build its repertoire in Vietnam and will continue to increase its landbank where prices are reasonable. So far, Eco Lakes has recorded about RM61mil worth of sales and RM31mil for future progress billings in phases one and two, while Eco Xuan has secured RM16mil in sales as at end-March. For years, Vietnam's central bank has kept interest rates in the 90-million population country at elevated levels to combat inflation. As at end-February, its inflation dipped significantly to 16.4% from a peak of 23% last August. HwangDBS Vickers Research said it was optimistic the Vietnamese government would effectively tackle this issue, with its in-house economists projecting a normalisation of its consumer price index to 10.2% in 2012 and 6% in 2013. “This will bode well for property sales in Vietnam going forward as low interest rates will boost home buyers' affordability. “However, property sales will remain slow for now as cash buyers have been exhausted and interest rates remain unattractive to prospective home buyers. “Property launches have slowed this year so far compared to the same period last year, mainly due to the oversupply of properties in the market. “The number of people attending new property launches has also reduced now,” it added. Currently, foreigners account for only 1% of total property transactions there, with the rest dominated by local buyers.